Real talk: Finding substantial sources of calcium has been more difficult than finding sources of protein or iron. I’m learning that although lots of foods contain calcium, they usually don’t contain a whole lot of calcium. That’s not necessarily bad; if you eat a varied diet, you probably acquire little bits of calcium from lots of sources. There just aren’t a lot of calcium powerhouses out there. So far this week, I’ve relied heavily on chia seeds, but let’s face it: woman cannot live on chia alone. It’s time to stop relying on the chia crutch. In my search for a new calcium crutch, I looked to the ever-faithful bean. Most beans offer a bit of calcium, but nothing to write home about (per cup, black beans have 5% of the RDV, dark red kidney beans have 6%, and pinto beans have 8%). But one bean stands out: the unassuming navy bean. With 13% of the RDV in a cup, they outpace their legume companions by a long shot. With this recipe, I’m taking full advantage of my new discovery. 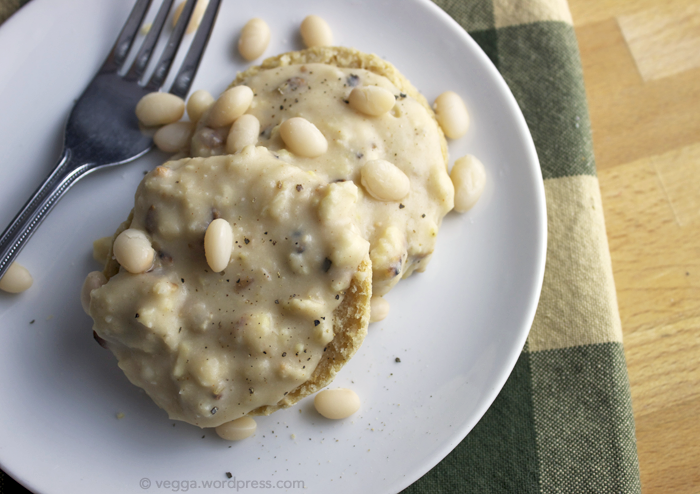 Navy beans make their way into the two main components of this savory plate of biscuits and gravy, and almond milk and tempeh help increase the calcium content. Using a standard blender or an immersion blender, puree the navy beans and almond milk until smooth. Set aside. Add flour, baking powder, baking soda, and salt to a large mixing bowl and stir to combine. Using a fork, pastry cutter, or your fingertips, cut in the vegan butter until the mixture is coarse and sandy. Make sure there are no large lumps of butter remaining. Add the almond milk and bean mixture and stir with a plastic spatula or wooden spoon until the dough comes together. Don’t over-mix. It’ll be sticky, but that’s okay. At this point, you can either refrigerate the dough for at least 20 minutes or go ahead and make the biscuits. Refrigerating the dough cools down the butter so that it melts into flaky pockets in the oven, but it’s not strictly necessary. When you’re ready to bake, place the dough on a clean, floured surface. Using a rolling pin, roll it to a little more than 1/2″ thickness. Use a floured glass rim or your favorite round cookie cutter to cut the dough into circles. Place circles on the prepared baking dish about 3/4″ apart. Ball up the dough, roll it out again, and cut more circles. Repeat until you’ve used up all the dough. Bake for 15-17 minutes or until the tops just begin to turn golden. There won’t be a big color change, so watch carefully. First, brown the tempeh. Add a little oil to the bottom of a large saucepan and heat over medium. Using your hands, crumble the tempeh into small chunks and add it to the pan. Cook for about 10 minutes, stirring frequently, until the tempeh is lightly browned on all sides. Be careful that it doesn’t burn. While the tempeh browns, use a standard blender or an immersion blender to puree the navy beans, almond milk, and roasted garlic until smooth. Set aside. Once the tempeh is browned, turn the heat down to medium-low and add the spices and butter to the pan. Once it melts, sprinkle on some of the flour and stir so the tempeh is coated. Pour in about a quarter of the liquid mixture and stir. Add a little more flour and liquid and whisk thoroughly. Continue until you’ve added all the flour and the liquid, whisking carefully to prevent lumps. When all ingredients are thoroughly mixed, turn the heat up a bit (if necessary) until the mixture just begins to bubble. Turn down again and let the gravy thicken, stirring frequently. Slice biscuits in half, top with gravy, and enjoy! 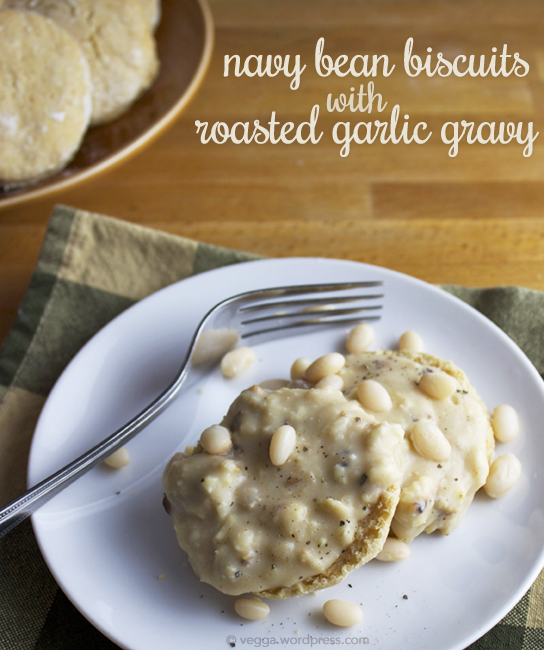 The navy beans stand in for some of the fat in the biscuits, making them less flaky than a full-fat biscuit. But once you top them with the rich, creamy, garlicky gravy, you won’t miss the fat! And you can’t taste the beans at all—I can testify to that. S was thoroughly surprised when I told him about that secret ingredient. Two of these biscuits will give you 5 grams of protein, 11% of your daily recommended value of iron, and 7% of your RDV of calcium. Half a cup of the gravy offers nearly 7 grams of protein, 8% of your RDV of iron, and a whopping 17% of your RDV of calcium. Thanks! Yes, I loved learning that little fact. I tend to think most beans have a similar nutritional makeup, but I guess not!